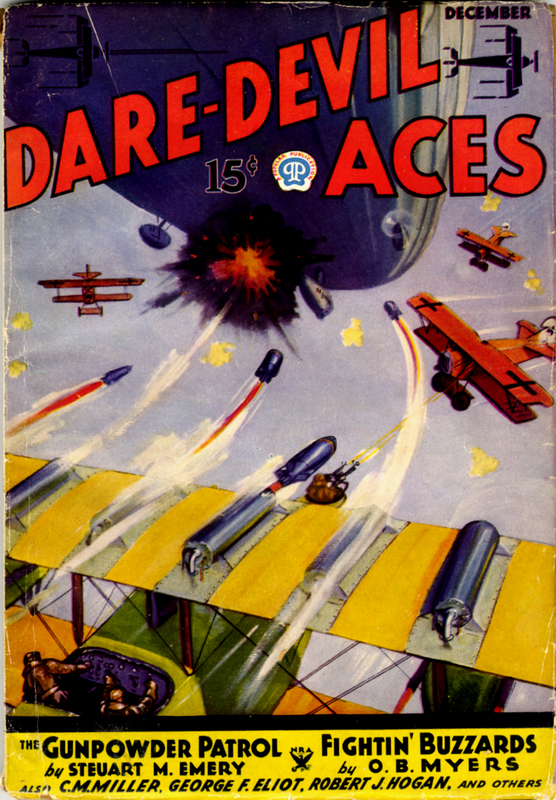 Frederick Blakeslee painted all the covers for the entire run of Dare-Devil Aces. And each of those covers had a story behind it. This time, we have more of the approach he used for the covers he painted for Battle Aces—telling us about the ship on cover. 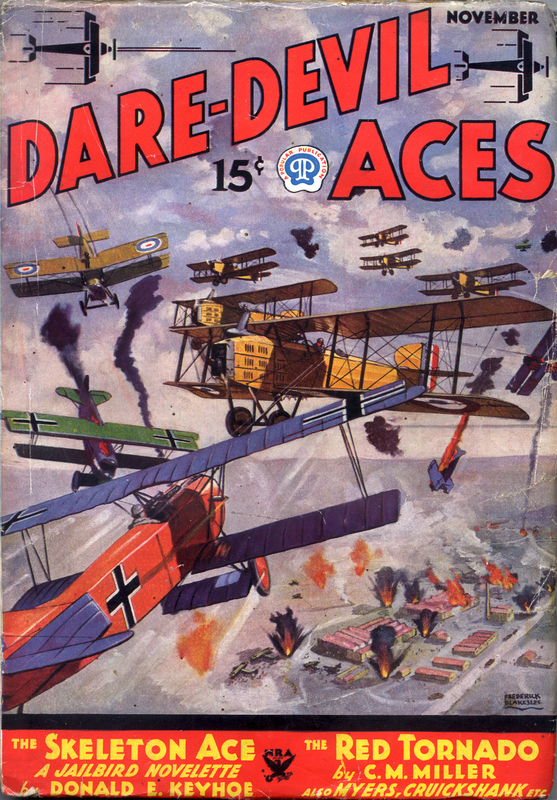 But, instead of Mr Blakeslee telling us about the ship on the cover, we have Mr. Robert H. Rankin, formerly a draughtsman for the Fokker Aircraft Corp telling the story of the Fokker D-VII on the cover of the February 1935 cover of Dare-Devil Aces. . . .
Now let’s review the history of the Fokker D-VII, written by an authority on the subject. Formerly Draughtsman, Fokker Aircraft Corp.
TO ANY one familiar with the fighting planes developed during the World War the Fokker D-VII is outstanding. It was superior to any other plane used by Germany and it was certainly the equal of any machine used by the Allies. Using the D-VII the German pilots were able to hold their own against a much larger force of Allied aircraft, and so great did the fear of these planes become that it was definitely stated in terms of the Armistice that all Fokker planes should be destroyed. The D-VII was the result of the gradual development of the earlier Fokker Fighters. When it was found that the 110 H.P. Le Rhone powered Nieuport easily outmoded the 80 H.P. Gnome powered Fokker the design of the Fokker tri-plane was completed. The triplane enabled the German pilots to gain a series of impressive victories and it was used by the great von Richthofen in many of his aerial duels. Although the speed of this plane was comparatively slow, its decided ease of maneuverability more than made up for the disadvantage. But its flight range was limited by a small gasoline capacity and Allied pilots found that the best way to escape it was to out-distance it. As it became apparent that the fighting planes of the Allies, and in particular the Sopwith Camels and Spads, were giving them the advantages of speed and flight range the design of the D Series Fokkers was started. The first of these was the D-I, a bi-plane powered with a 120 H.P. Mercedes, and like the rest of the series it was fast and efficient. About this time the Albatros works (Albatros Werke) began production of the D Series Albatros machines. The Albatros D-II proved itself superior to the Fokker D-I and by 1917 the later developed D-III had surplanted the Fokkers at the Front. This Albatros was powered with a 175 H.P. Mercedes, weighed 1,470 lbs. and carried a useful load of 297 lbs. These D Series Albatros planes were a bi-plane design, having a small lower wing (made of a single spar) connected to a larger upper wing with a V strut. Any combat advantages which the Albatros offered were offset by the fact that the plane was structurally weak and the wings could not stand torsions. Consequently, when fighting the Albatros, Allied pilots had but to put their planes into a steep dive to be safe. Many German airmen were killed when their planes went to pieces in mid-air; the celebrated Captain Boelke met death when the wings of his Albatros pulled off while he was flying over his own lines. Several pilots deliberately wrecked their machines rather than take them into the air. The father of the D-VII was a bi-plane of somewhat radical appearance. Its fabric-covered fuselage was made of wood covered welded tubing, making a clean and decidedly streamlined job. The wings were built up of wood in much the same manner as were the wings of the later Fokker commercial types. Although this plane offered every advantage and was years ahead of its time in many ways it was refused by the German High Command. Realizing that little satisfaction could be had from the German government (politics meaning more to them than efficient fighting equipment) Mr. Fokker managed to contact the important pilots. He found that they were not satisfied with the planes and materials furnished them and they desired to select their own equipment. After some difficulty and much red tape an open competition of the leading makes of military planes was held. For this competition Fokker redesigned his bi-plane and the D-VII was born. The D-VII was characterized by its cantilever wings (made up of box spars). No wires or external braces were used and the wings were joined together at the tips with a single strut. The fuselage was of a rectangular cross section which feature made for simplified manufacturing and quantity production. By streamlining the landing gear axle with a tiny wing, speed was added to the plane. The D-VII fast became a favorite of the pilots. Although the Rumpler climbed faster, it handled very badly, especially on the turns. So great was the demand for the new Fokker that the factories making other planes were required to stop production of their own types and concentrate on the building of the D-VIIs. The following figures give an insight into the construction and performance of the plane. Total wing area, including ailerons 236 sq. ft.
Max. cross section area 9.35 sq. ft. The endurance of the Fokker D-VII is, full throttle at 10,000 feet (including climb) 2 hrs. 13 minutes. Minimum speed of the D-VII at sea level (lowest throttle) is 62 miles per hour. 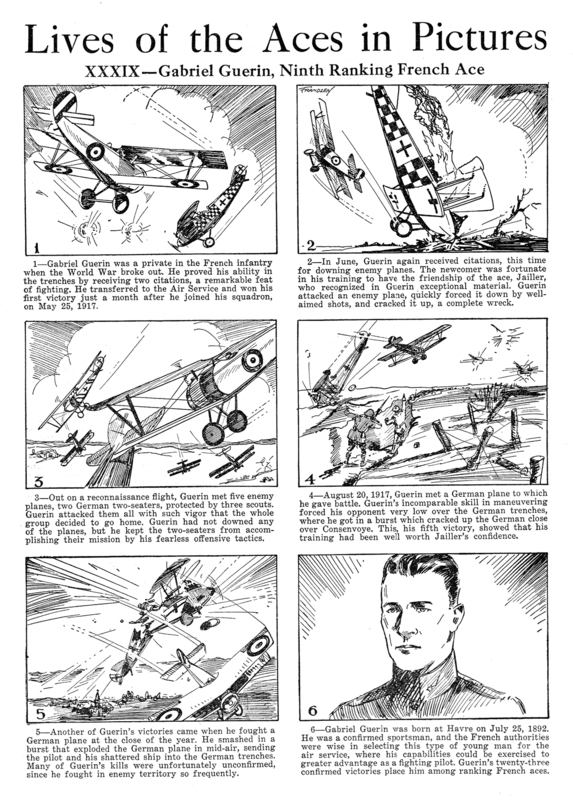 Mr. Blakeslee covered the Fokker D-VII himself with the story of Billy Bishop for the cover of the February 1932 number of Battle Aces. Raoul Falconia Whitfield (1896-1945) is probably best remembered for his hardboiled crime fiction published in Black Mask such as the Jo Gar stories about a Filipino detective in an inter-war Manila. 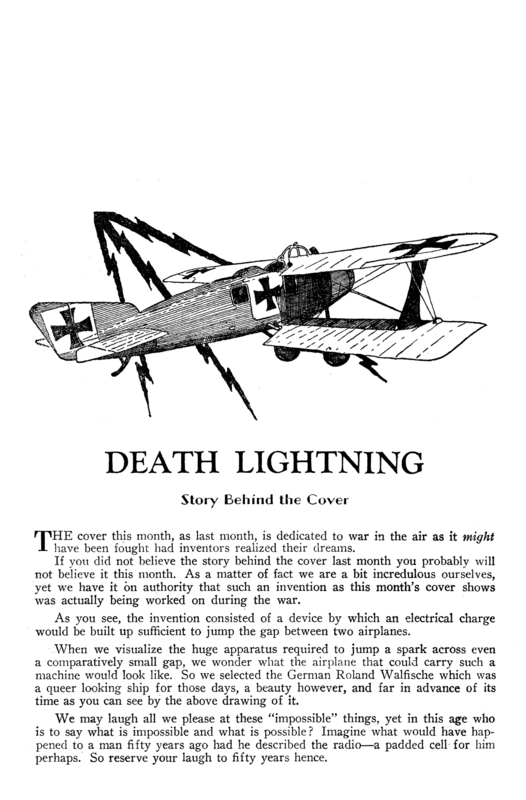 But Whitfield also wrote fiction for titles like Adventure, Blue Book, Breezy Stories, Everybody’s Magazine, as well as Battle Stories, War Stories, Boy’s Life and Air Trails. Frequently his stories in Air Trails featured “Buck” Kent, an adventurous pilot for hire. The stories, although more in the juvenile fiction vein, do feature some elements of his harder prose. 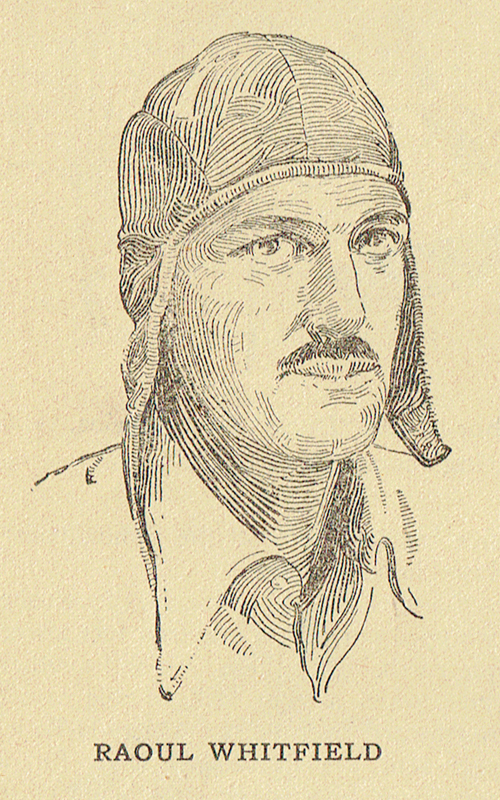 The July 1929 issue of Air Trails featured two pieces by Whitfield. 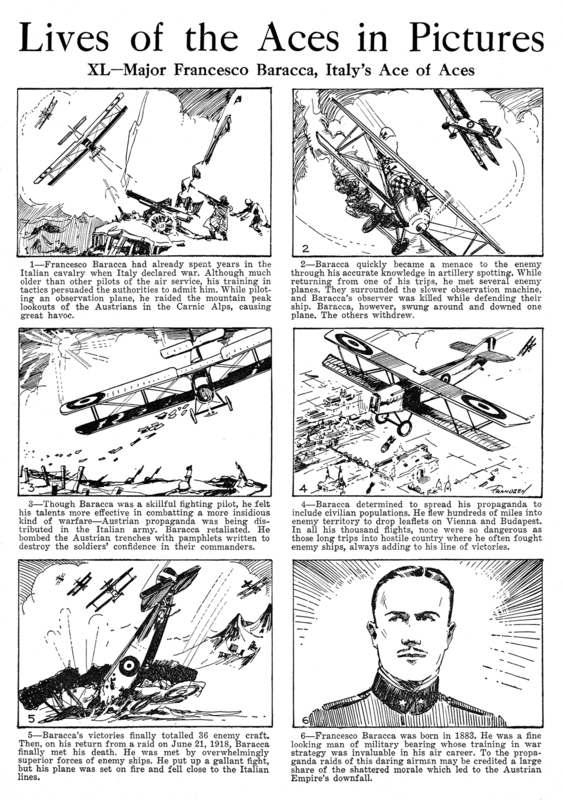 There was the monthly dose of the adventures of “Buck” Kent and in the back of the issue was a cheifly autobiographical piece from his time as an aviator in the first World War. The autobiographical article is presented below; while the “Buck” Kent story, “Sky Lines” can be downloaded at the bottom of the post. Mr. Whitfield, famous pilot-writer, author of the “Buck” Kent stories, tells about some of his own exciting moments in the air. We have to go back to the days when a lot of good chaps were getting into tail-spins and not getting out of them. Back to war days. There was the time a De Haviland’s Liberty conked out, over the Gironde River in France. That wasn’t so good, even though Lieutenant Whitfield did stretch the ship’s glide and reach a sandy strip along the stream’s edge. There was the time a Nieuport got her nose down and went into a tight spin five hundred feet off the ground, near Issoudoun, France. That wasn’t so good, even though she whipped out of it a hundred feet above the earth. And there was still another time when a gray wall of fog swept northward across Colombey-la-Belle, and sent the lieutenant down for a nose-over on a soggy stretch too close to the front for comfort. And there were the seconds when a J.N. 4’s wings scraped those of another Jenny—at Kelly Field, Texas. But the sky seconds that counted most slipped by at St. Jean de Monts, on the Bay of Biscay, France. This fellow Whitfield was flying a dep-control S.A.E. She was a terrible crate, and he was testing her out for target towing. In the rear cockpit of this two-place ship was a noncom who had never tossed out a wrapped target sleeve before. The lieutenant was flying over the beach, headed into the wind. He got the ship’s nose up and nodded his head. The noncom stood up and the prop wash battered him off balance. Instead of tossing the packed silk out, he held it momentarily. Whitfield shoved the wheel forward and the nose dropped. A down current dropped it a bit more. The noncom recovered his balance—and let the packed target sleeve go. The tail assembly slanted up—and the silk lodged between the rudder and elevator fins. The wind pressure jambed it there, tight—very tight. The plane was going down with power on, her dive angle around thirty degrees. And the more Lieutenant Whitfield tugged on that wheel—the worse the silk sleeve jamb became! Seconds were counting, and counting big! THE lieutenant swore at the noncom, howled at him to jerk the pack loose. The lieutenant cut the throttle speed, and stared down at the white beach. The ship had less than two thousand feet, and her dive angle was just right for a sweet crash. A crash in this particular plane meant that the pilot would rate the engine in his lap, and plenty of fire to top off. Whitfield was pretty scared. But he worked the wheel forward and backward, perhaps an inch. That would have meant something in a Nieuport or a Sop. But this crate didn’t notice the movement. And the target sleeve stuck like Bishop on a Boche’s tail. The noncom was pulling at the rope coil—methods were crude in those days—but it was no go. Five hundred feet above the sand, Lieutenant Whitfield cut the ignition switch and thought of a girl back in the States. (He married the other one later). He was still tugging at the wheel control, a hundred feet off the sand. But the dive angle was still thirty degrees or better. It looked like he’d eaten his last Bay of Biscay lobster and partaken of his last bottle of Mumms’ champagne. Then the wheel pulled back an inch—two inches—three inches! That helped. There was still plenty of crash. The undergear went first, then a wing ripped along and buckled. The plane nosed over and the prop splintered. The pilot and the sergeant crawled out of the wreckage. The ship didn’t burn. She sizzled, but she didn’t fry. The silk sleeve was still lodged between the rudder and elevator fins, partially opened. As the lieutenant writes, he yawns and looks at a splinter of that ship’s prop, hanging on the wall. A lot of seconds pass by in eleven years. But he didn’t yawn then—and every second counted when he tugged at that diving crate’s wheel. “Buck” Kent matches his airman’s wits with the snarling bullets of bandit guns. 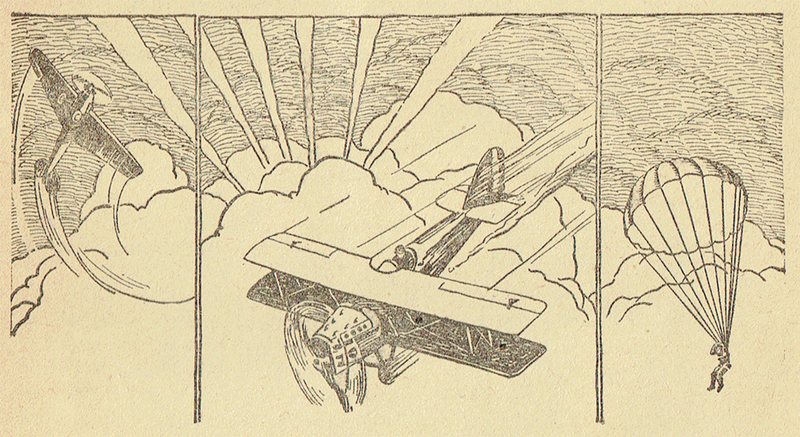 Back with another of Eugene Frandzen’s “Lives of the Aces in Pictures” from the pages of Flying Aces Magazine. The series ran for almost four years with a different Ace featured each month. This time around we have the October 1935 installment featuring the illustrated biography of Italy’s Ace of Aces—Major Francesco Baracca! Major Francesco Baracca is Italy’s greatest Ace of WWI but started his millitary carrer in the cavalry before the war with the prestigious Piemonte Reale Cavalleria Regiment upon his commisioning in 1910. Baracca’s interests turned to Aviation a few years later when he was transfered from Rome to a small town in central Italy and learned to fly at Reims, France. 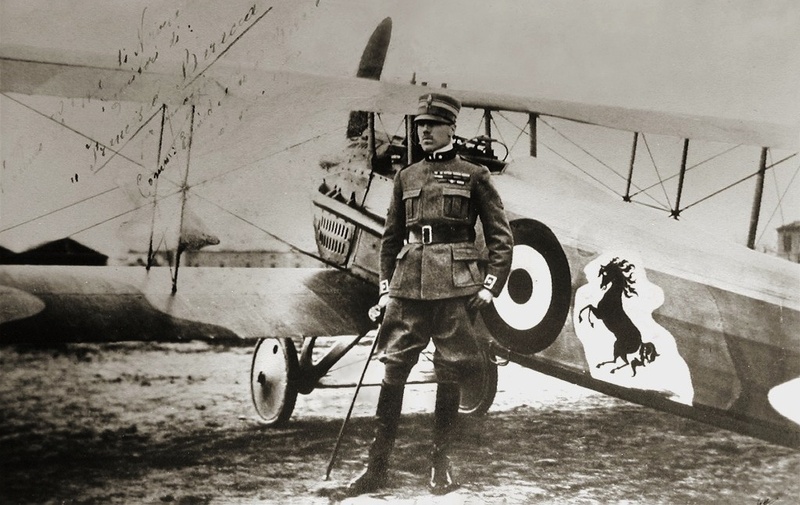 Son of a nobleman, Barraca is credited with 34 victories and emblazzened the fuselage of his plane with his personal emblem, a black prancing horse—the Cavallino Rampante—in tribute to his calvalry days. It is this emblem that his mother gave to Enzo Ferrari in later years to be the official symbol of the Scuderia Ferrari Racing team since 1929 and later Ferrari Automobiles. He was killed while out on a straffing run in June 1918. DOES this cover look fantastic? Perhaps it does, but it is based on actual fact. During the war inventors were busy all over the nation. The butcher, the baker, the candle-stick maker, all turned their minds to contraptions calculated to win the war. Farmers who had never seen the sea went to work on unsinkable ships, clerks in the corner store who had never seen a big gun, invented marvelous shells. Almost without exception the thousands of war inventions that flooded the patent office were useless and often fantastic. Without exception however the individual inventors were serious in their intentions and the government wisely treated even the fantastic inventions with the respect they deserved. The government realized that someone somewhere might turn in a workable idea. Occasionally workable ideas were received from obscure inventors and in such a case government engineers were dispatched to the inventor to investigate, test and report. Many new and workable war inventions were acquired in this way but that was the exception and not the rule. 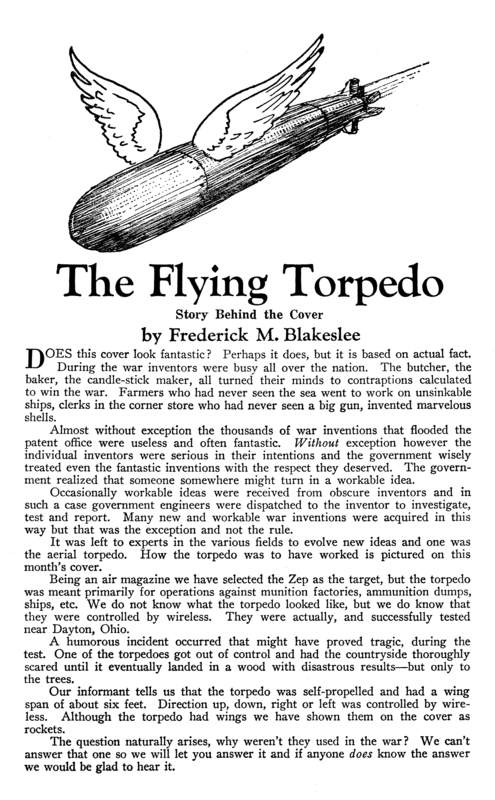 It was left to experts in the various fields to evolve new ideas and one was the aerial torpedo. How the torpedo was to have worked is pictured on this month’s cover. Being an air magazine we have selected the Zep as the target, but the torpedo was meant primarily for operations against munition factories, ammunition dumps, ships, etc. We do not know what the torpedo looked like, but we do know that they were controlled by wireless. They were actually, and successfully tested near Dayton, Ohio. A humorous incident occurred that might have proved tragic, during the test. One of the torpedoes got out of control and had the countryside thoroughly scared until it eventually landed in a wood with disastrous results—but only to the trees. Our informant tells us that the torpedo was self-propelled and had a wing span of about six feet. Direction up, down, right or left was controlled by wireless. Although the torpedo had wings we have shown them on the cover as rockets. The question naturally arises, why weren’t they used in the war ? We can’t answer that one so we will let you answer it and if anyone does know the answer we would be glad to hear it. 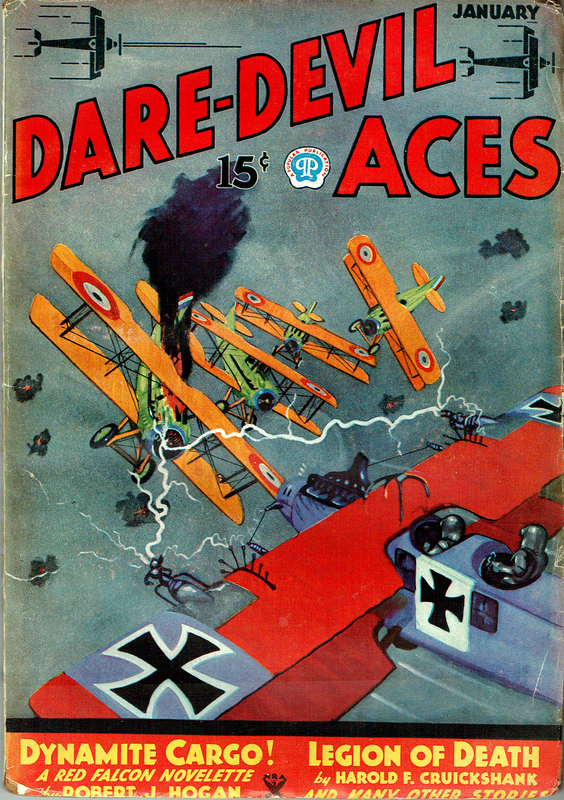 Frederick Blakeslee painted all the covers for the entire run of Dare-Devil Aces. And each of those covers had a story behind it. 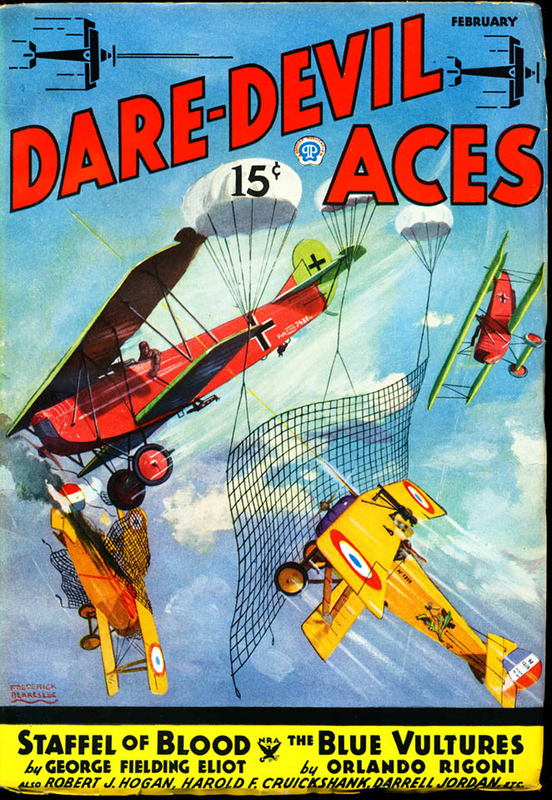 This time, Blakeslee presents us with more of the approach he used for the covers he painted for Battle Aces—telling us about the ship on cover of the November 1934 cover for Dare-Devil Aces. . . . THE BREGUET pictured on the cover was one of the most successful bombers produced by France during the war. There are several types, the 14 A 2, 14 B 2, 16 B.N.2. and the three-motored machine. The ship here shown is a 14 B 2 and is from a Signal Corps photograph. The BREGUET was designed by M. Louis Breguet, one of the great pioneers of French aviation. He was one of the first designers to produce a satisfactory tractor biplane. 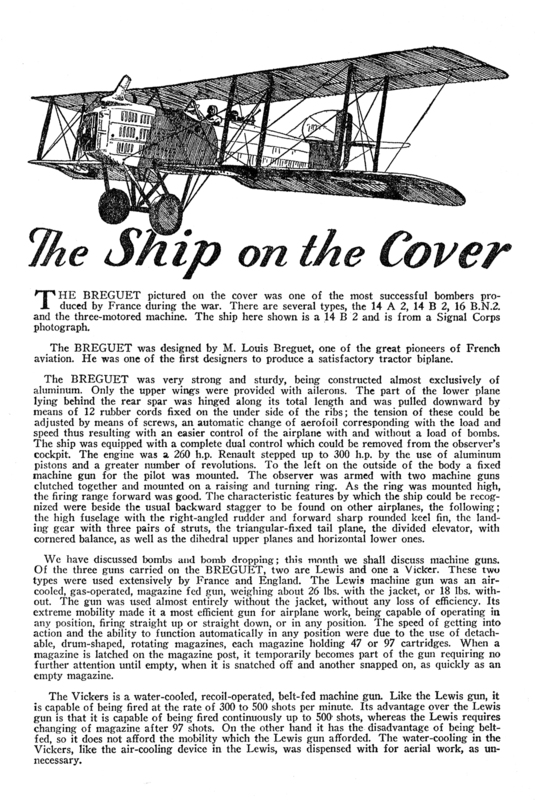 The BREGUET was very strong and sturdy, being constructed almost exclusively of aluminum. Only the upper wings were provided with ailerons. The part of the lower plane lying behind the rear spar was hinged along its total length and was pulled downward by means of 12 rubber cords fixed on the under side of the ribs; the tension of these could be adjusted by means of screws, an automatic change of aerofoil corresponding with the load and speed thus resulting with an easier control of the airplane with and without a load of bombs. The ship was equipped with a complete dual control which could be removed from the observer’s cockpit. The engine was a 260 h.p. Renault stepped up to 300 h.p. by the use of aluminum pistons and a greater number of revolutions. To the left on the outside of the body a fixed machine gun for the pilot was mounted. The observer was armed with two machine guns clutched together and mounted on a raising and turning ring. As the ring was mounted high, the firing range forward was good. The characteristic features by which the ship could be recognized were beside the usual backward stagger to be found on other airplanes, the following; the high fuselage with the right-angled rudder and forward sharp rounded keel fin, the landing gear with three pairs of struts, the triangular-fixed tail plane, the divided elevator, with cornered balance, as well as the dihedral upper planes and horizontal lower ones. We have discussed bombs and bomb dropping; this month we shall discuss machine guns. Of the three guns carried on the BREGUET, two arc Lewis and one a Vicker. These two types were used extensively by France and England. The Lewis machine gun was an air-cooled, gas-operated, magazine fed gun, weighing about 26 lbs. with the jacket, or 18 lbs. without. The gun was used almost entirely without the jacket, without any loss of efficiency. Its extreme mobility made it a most efficient gun for airplane work, being capable of operating in any position, firing straight up or straight down, or in any position. The speed of getting into action and the ability to function automatically in any position were due to the use of detachable, drum-shaped, rotating magazines, each magazine holding 47 or 97 cartridges. When a magazine is latched on the magazine post, it temporarily becomes part of the gun requiring no further attention until empty, when it is snatched off and another snapped on, as quickly as an empty magazine. The Vickers is a water-cooled, recoil-operated, belt-fed machine gun. Like the Lewis gun, it is capable of being fired at the rate of 300 to 500 shots per minute. Its advantage over the Lewis gun is that it is capable of being fired continuously up to 500 shots, whereas the Lewis requires changing of magazine after 97 shots. On the other hand it has the disadvantage of being belt-fed, so it does not afford the mobility which the Lewis gun afforded. The water-cooling in the Vickers, like the air-cooling device in the Lewis, was dispensed with for aerial work, as unnecessary. Next time, Mr. Blakeslee brings us the fanciful tale of “The Flying Torpedo” for the December 1934 cover. Be sure not to miss it. 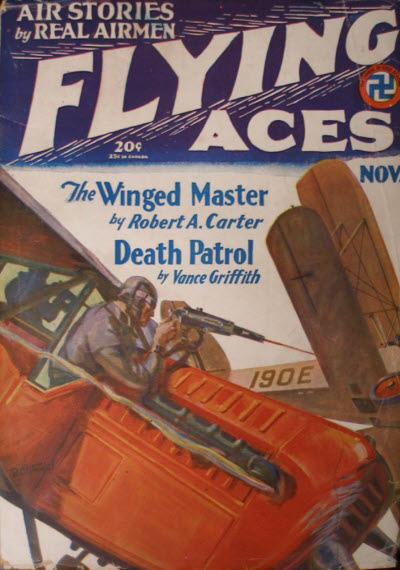 Back with another of Eugene Frandzen’s “Lives of the Aces in Pictures” from the pages of Flying Aces Magazine. The series ran for almost four years with a different Ace featured each month. This time around we have the September 1935 installment featuring the illustrated biography of the ninth ranking French Ace—Gabriel Guerin! Sous Lieutenant Gabriel Fernand Charles Guerin was credited with 23 confirmed victories—including five of which he shared—and a reported 10 more unconfirmed. Most of these victories were while a pilot in SPA 15. 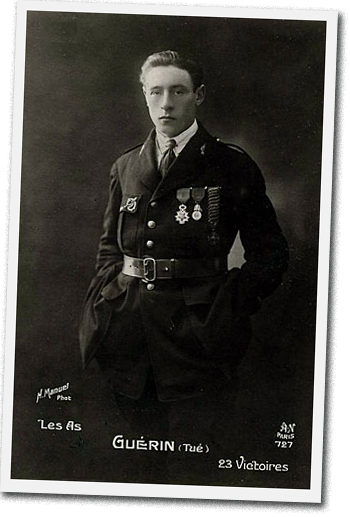 As we said he was France’s ninth ranking Ace in the First World War and was awarded the Legion d’honneur, Médaille Millitaire and the Croix de Guerre with 15 palms and two bronze stars! Sadly, Guerin died when the aircraft he was piloting, a SPAD VII, spun out of control and plunged to the ground soon after take-off near Mont l’Eveque on the 1st of August 1918. He was 26.